Suziqu's Threadworks: One More Giveaway and One More Winner! to make this class happen for you Lesley. ***Please Lesley email me now with your details. approx. 1 week away when the class begins. Yeah! to begin but now it is just a matter of days!!!! so much interest and enthusiasm in this coming venture. Well Suzy there is no denying I would love to be a winner of your wonderful class and journal giveaway!! Always beautiful work my friend! Another gorgeous piece, Suzy! Congrats to the winner, and yeah me, I get another chance to win, too! Happy weekend. I would love to win this gorgeous piece. Count me in. Suzy, I follow your blog!)) fabric collage wall hanging is a pure beauty! Congratulations to Lesley, I know she is thrilled!! I know that Leslie will be absolutely delighted to have won your giveaway, congrats to her. As to the new giveaway, I can't help myself, I just have to enter, even though that seems a tad greedy as I have some of your beautiful creations already. But this collage is so very beautiful, and so soft and gentle and just what I need to cheer me up ( leaving the cottage for a while, sob sob ). Thanks Suzi for a chance to win an amazing fabric collage. It has long been a fan of your creativity and your blog. Suzy, I'm sure I'm dreaming. Thank you so much. It's the best thing that's happened to me for a very long time. I can't wait to get started, and I hope I can produce work that justifies this wonderful gift you've given me. I'm truly sorry for those of you that did not win. I know how disappointed you must be, but I'll try not to let you all down, by not doing a good job.Thank you again Suzy. blessings. PS I have sent you an e-mail with all my details. All the best and thank you for sharing the love of the art form. Congratulations go out to Lesley in the UK for winning a spot in your first online class. I am so looking forward to starting the class next week. While I have a few of your beautifully handcrafted pieces of art, I would love to win this collage. As always, your work is gorgeous. Thank you for the opportunity to learn from you starting next week and for the chance to win another gorgeous collage by you. I am very much looking forward to your class. My Dad passed away last week and I know I will be thinking of him as I go through your process for creating a wonderful keep sake. Thanks. Well, I'm so excited that the class is almost here! I love everything you make and am so happy to be a follower of you lovely blog. I have been a long time fan of your gorgeous work, and to have the chance of winning a gorgeous creation of yours would be like all my Christmases coming at once. Good luck everyone, and congratulations Lesley. Looking forward to following your progress! 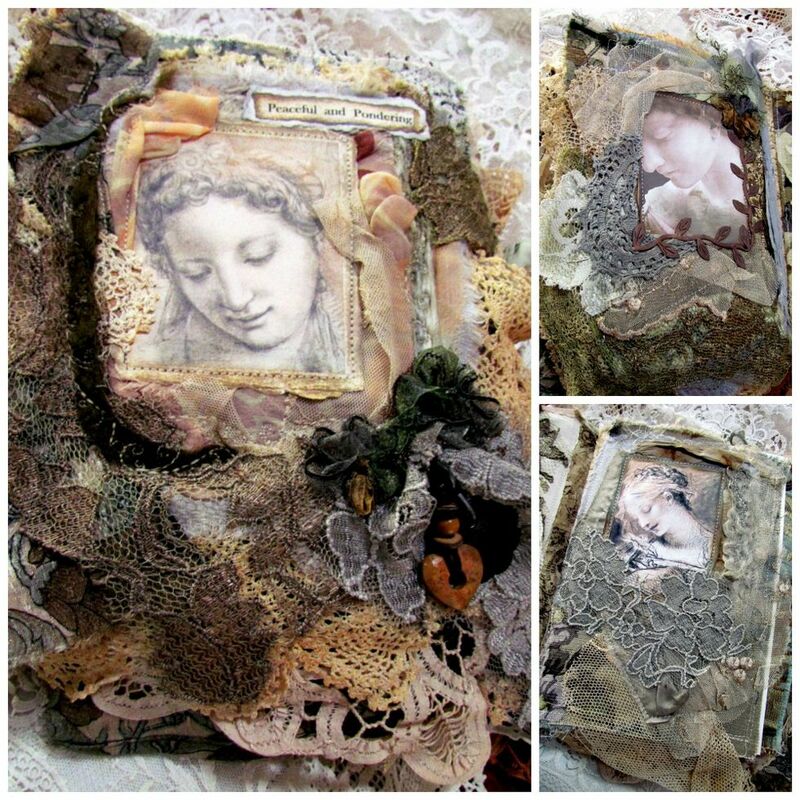 I follow your blog and I would love an opportunity to win your beautiful collage. This renaissance inspired collage really speaks to me of tenderness. The smiling image of the Madonna surrounded by such soft delicate fabrics, lace and fibres is music to my soul. Congratulations to Lesley - she will be "over the moon" with excitement and I'm thrilled for her, she is a most worthwhile winner. I'm looking forward to meeting her in class! Only six more days now until the door opens to your magical world of creating with fabric and lace - I feel like a little child waiting for Christmas ha ha! Everything you create is magical. I wish you the best of luck with your new online workshop. Congratulations to the winner and thanks again Suzy for the opportunity to go into the draw to win this beautiful collage wall hanging. Oh yes - you know I follow you. Wouldn't miss a thing - ever. I would be in hog heaven should I win something from you. Made with love with your own special hands. Of course I follow your blog! Your Art is Amazing, your collages are breathtaking, & your pulling together of fabrics is a talent. I would be honoured to win one of your giveaways. Congratulations Leslie! I look forward to meeting her in class. And yes, it's getting close now and the excitement is building. (still no visit from our pesky mailman bearing treasures...I stalk him every day). Just gorgeous! I love reading about your creative doings. Working with vintage lace is something I very much enjoy. Lucky lucky Lesley! Huge congrats indeed. Once again you've picked just the right colours for your gorgeous piece for this giveaway! Stunning!